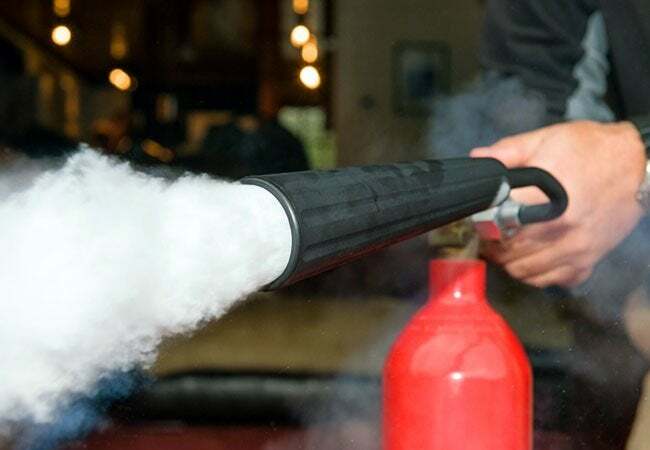 Here’s everything you need to know about getting the right fire extinguishers and using them effectively. Fire extinguishers are like insurance: You have it in hopes of never needing it (and there’d better be at least one in your home!). But if it came down to it, would you be able to use it? There’s no better time than the present—before a stressful situation with flames—to familiarize yourself with these must-have emergency devices. 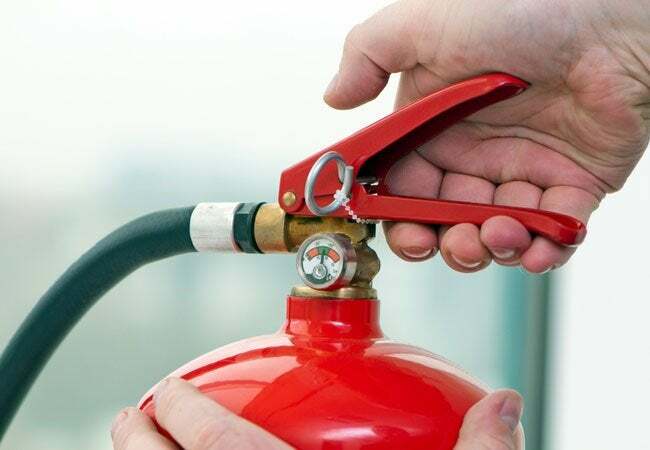 Ahead, you’ll find a crash course in the types of extinguishers and the fires they quell, followed by a step-by-step guide for how to use a fire extinguisher effectively. As you no doubt learned in high school science, fire needs oxygen, fuel, and heat to sustain itself. Remove any one of the three and the “fire triangle” collapses. Yet with different fuel sources, fires must be fought differently, so be sure your extinguisher has the correct agent—be it foam, water, dry chemical, or wet chemical—for the particular fire. Using the wrong extinguisher can make a dangerous situation worse. • Fire extinguishers typically found in homes tend to be water- or foam-based. Industry experts recommend homeowners have an all-purpose ABC dry chemical extinguisher to handle a variety of fires, except kitchen grease fires. • Class A fires involve common combustibles like wood, paper, plastic, cloth, and trash. • Class B fires are caused by flammable liquids like gasoline, kerosene, and oil (but not cooking oil or grease fires). • Class C fires begin with electrical sparks. • Kitchen fires, known as Class K, should never be fought with water. To battle a small grease fire in a frying pan, turn off the heat and cover the pan with a metal lid or throw a large amount of baking soda all over it. If you regularly cook with big quantities of cooking oil, purchase a “wet chemical” extinguisher rated for grease fires (it will work on some Class A fires as well). All extinguishers are only meant to deal with fires in the “incipient stage,” which is fire department lingo for “just getting started.” If the fire is as tall as you, leave the area immediately, close the door to the room, and call 911. Pull the pin, usually attached to a plastic or metal ring, put in place to prevent accidentally squeezing the lever. When pulling the pin, be careful not to press the lever yet or you’ll break the canister’s seal and decompression will begin. Aim the nozzle or hose at the base of the fire. This is critical—blasting the flames won’t stop the source of the fire. Stand at least 6 feet away from the fire (extinguishers have a range of 6 to 20 feet distance for spray, so check your extinguisher for specifics). Squeeze the lever to spray the extinguishing agent. An average extinguisher has around 10 seconds of spraying time, so you’ll need to be precise and fast. Sweep the nozzle or hose side to side until the fire has been put out. Close in on the fire as it diminishes, watching closely for re-ignition. Where there’s smoke, there’s fire, so any smoke at all means the fire isn’t fully out yet. The best indication that the fire is out is that the area is cool to the touch. Proceed cautiously, holding out your hand to feel for heat, before you start touching charred surfaces. If you’ve used your fire extinguisher, you can likely refill or recharge it. Contact the manufacturer or your local fire department to learn if that’s possible, and if so, where to go. If unable to refill it, let your discharged fire extinguisher rest for a few days to completely depressurize, then dispose of it in your trash, or contact your local fire department for info on recycling it. If necessary, purchase a new extinguisher without delay. Experts recommend storing extinguishers mounted near a doorway. 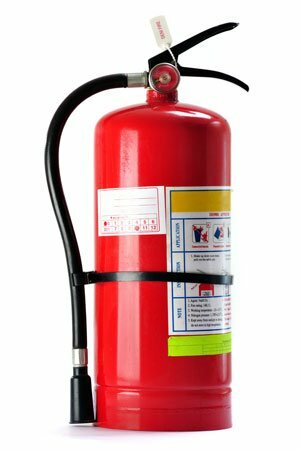 Never store an extinguisher near a stove and, because leftover chemicals and paints make garage fires potentially very dangerous, be sure to mount an extinguisher by the garage entrance. Check your extinguisher regularly, preferably monthly, to ensure the pin is in place and the pressure gauge shows either between 100 and 175 psi, or the needle is in a green “ready” zone. If not, replace it or contact your local fire department to see if they can recharge it or recommend where to go to have this done. Now, armed with proper extinguisher knowledge, you’re ready to tackle any small fire. But remember, do not confront any fire as large as you. Fires can grow double in size every 60 seconds, so be smart, be safe, and protect yourself.